YouVersion, the force behind the ubiquitous iOS/Android Bible app, unleashed a new website this past week. It’s clean, sleek, and very easy to use. I use the Bible app all the time, but at work, it’s far easier to go through my Bible reading plan on their website. Needless to say, I’m very excited for this new web interface that they’ve developed. It looks great and works well—what more could you ask for? In case you’re new to YouVersion, it was started in 1996 by LifeChurch.tv and has grown by leaps and bounds since and will certainly continue to do so. 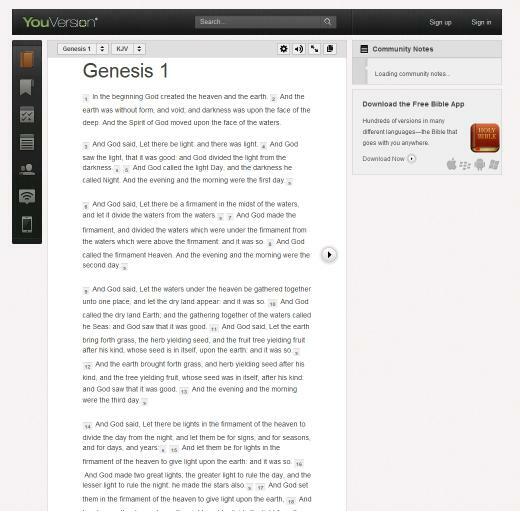 YouVersion offers, of course, a free website for general Bible reading but that’s nothing. Once you sign-up for am account, you have access to tons of features like Bible reading plans, personal bookmarks and notes, along with community discussion features—because the Bible wasn’t meant to be experienced in isolation. In addition to all of this, you can keep up with your Bible reading while on the go through one of their mobile apps, which span all popular mobile platforms. You get all of these features, and it’s free! Awesome! So, if you haven’t signed up yet or haven’t visited the website in a long time, head over to YouVersion.com and take a look. Then, go and invite some friends to do the same. Why shouldn’t the Bible go viral? What do you think of YouVersion’s new site? Do you use the Bible app on your smart phone/tablet? It’s a sweet redo – they need the API release, though, so we can integrate it with our websites. That would be awesome! I’d love to be able to create a custom Bible study plan for my youth group through YouVersion. Maybe someday. 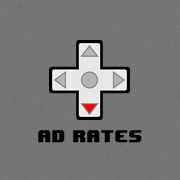 What are you wanting to use their API for? 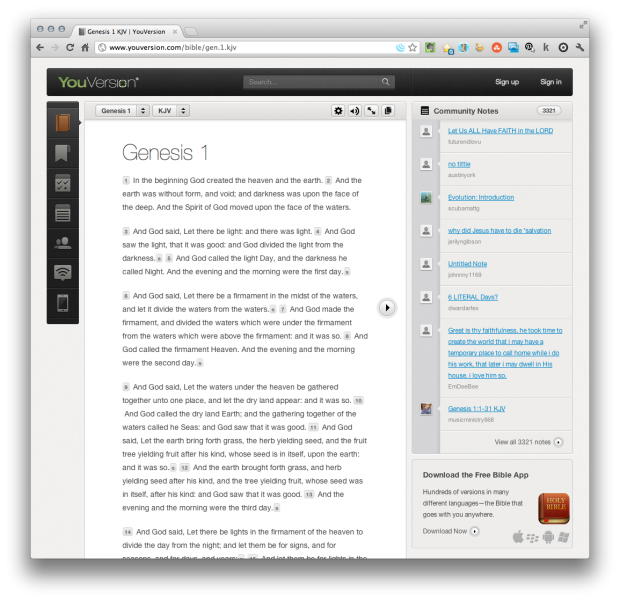 There are a number of great Bible plugins avaiable for WordPress. No joke! I couldn’t believe it. I would love to see a retro version, just to see if it matches my vision of what it would look like. Wow! Awesome! Thanks for sharing, brother. Amazing! Thanks for the update. I wasn’t aware they finally rolled out a website. Wake up each morning to the mobile app, but this is a pleasant change for an easy read. I completely agree about the “easy read.” I love the iOS app, but for my lunch-time reading at work, I use the website exclusively. It’s a really nice redesign. Congrats to Bobby and Terry. I also like to use the Bible.is app because the my 3yo likes to listen to the Bible too. I’d never heard of that app. I’ll have to check it out. My 18 mo. old would probably love it, too. I would like to thank you for all you do. I use you youversion daily and honestly don’t know what I would do without it. Keep up the good work and may the Lord watch you as you carry on spreading his word. Hey, Bud. We actually don’t have anything to do with how awesome YouVersion is, but we do agree with you about how awesome it is!